Preparing to take on the world’s best sailing teams requires the highest quality people, partners and suppliers at every level. When Emirates Team New Zealand announced last June that it was challenging for the 34th America’s Cup to be sailed at San Francisco in 2013, they had already chosen their preferred suppliers of everything from sailcloth right down to Tork Premium Multipurpose Cloths 530. Andrew Nottage is the Shore Manager of the New Zealand base where he manages 23-shore crew responsible for repairs, maintenance and development of boats related to the America’s Cup campaign. 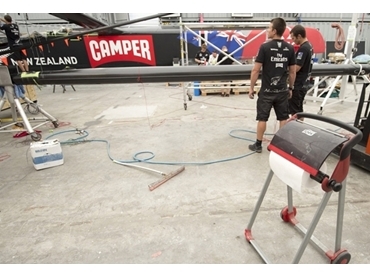 With a fleet of boats that include two SL33 catamarans based in Auckland, one AC45 for America’s Cup pre regattas, plus the V70 boat CAMPER with Emirates Team New Zealand in the Volvo Ocean Race, maintenance can be very demanding. In July the team adds the first of its AC72 cats to its fleet. Tork Premium Multipurpose Cloth 530178 is strong so you can scrub hard without the cloth falling apart. Plus they have a textured surface, which makes it easy to remove grease and stubborn spots. Before using Tork Premium Multipurpose Cloths, Emirates Team New Zealand was using loose rags which had to be restocked, washed and often – found. With Tork dispensers strategically located within easy reach in all workshops, multipurpose cloths are now on hand, which is more efficient and faster. When it comes to yacht racing that’s really what counts.